Onix quickly understood our needs and delivered easily digestible reports to show next steps. Pipedrive is really happy now with our Maps offering and happy to be with Onix. Pipedrive CRM is a sales pipeline management software application that's simple to use but yet delivers powerful results. Pipedrive has been an Onix customer since July 2014, and a Google Maps Platform customer since the company was founded in 2010. The company has offices in Menlo Park, CA and Tallinn, Estonia. They are proud to be part of the AngelPad alumni group. (AngelPad is an intensive mentorship program founded by ex-Googler Thomas Korte to help web-technology startups build better products, raise the funding they need to succeed and ultimately grow more successful businesses.) Today, Pipedrive has 60 employees and more than 12,000 business customer accounts worldwide. Pipedrive's roots are grounded in direct sales. As sales managers and trainers, two of the co-founders experienced an increasing amount of pain with the CRM software that existed at the time. There was simply no good solution for managing a company's sales pipeline. So in 2010, they teamed up with talented developers to create Pipedrive. One of Pipedrive’s key features is its integration of Google Maps Platform, an immensely helpful tool for any field sales team. When Pipedrive’s offering first appeared on the market, it integrated with Google Apps (now G Suite); users appreciated the easy contacts and calendar sync. However, the company wanted to integrate Google Maps Platform to take the software to the next level. Because Pipedrive’s CTO and co-founder, Martin Tajur, was very familiar with Google APIs, implementing the Maps integration was completed very quickly. The Places API was especially helpful. Considering that Pipedrive has customers around the world, Google Maps Platform can handle any address challenges, regardless of format. Pipedrive’s team was able to build their integration — and then revise it over time. Onix entered the picture, Ocean said, because “Pipedrive may not have used best practices when setting up our Maps for Business instance." Onix came in and helped with the licensing agreement and also reviewed the usage stats. According to Ocean, Onix delivered white glove service throughout the process. Being a startup, things move quickly at Pipedrive. Onix showed the team how to reduce map costs while increasing map usage. 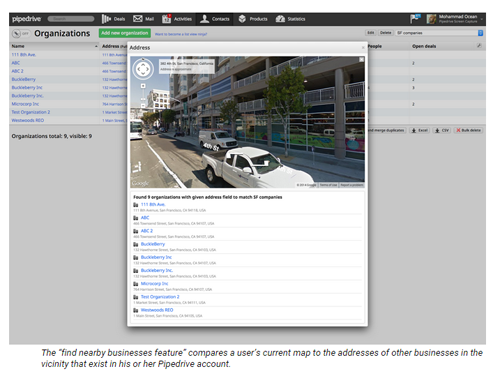 Integrating Google Maps Platform into Pipedrive allows users to visualize sales data on a map. 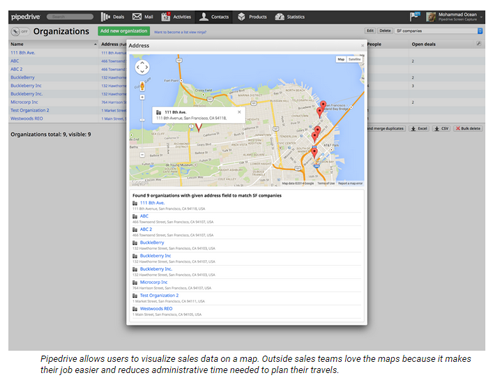 Each member of a field sales team can use Maps to plan out his or her day. Team members can find customers by zip code, city, state, or however they are planning their travels. Outside sales teams love the maps because it makes their job easier and reduces administrative time needed to plan their travels. Pipedrive also uncovers potential opportunities by offering a simple find nearby businesses feature that compares a user’s current map to the addresses of other businesses in the vicinity that exist in his or her Pipedrive account.